Summary: This article describes the Oregon Writing Project’s visioning retreat and includes links to their retreat invitation, their annotated list of online resources, retreat agenda, and newsletter. This resource will help in building site capacity when challenges and opportunities of transition arise. It might be a cliché, but it’s true: transitions present challenges and opportunities. In 2008 I was stepping in as director of the Oregon Writing Project at Willamette University, and our longtime invitational summer institute director, Steve Jones, was stepping out of that position to develop other site initiatives. Our leadership team had just revised the site’s governance structure. We had hired our first administrative assistant, claimed our first office space, and implemented new systems for processing activity reports and stipend payments. At the same time, we had a new, energetic inservice coordinator who presented the site with burgeoning inservice opportunities. In order to take advantage of opportunities and overcome challenges, we applied to the 2008 NWP Directors Retreat, welcoming the prospect of a three-day event that promised time to reflect, space for renewal, and access to resources and conversations with a community of colleagues. In the rugged, rural setting of Red Lodge, Montana, we discussed the NWP model and, by extension, the work of leading a site. Together we wrestled with ideas encountered in chapter 2 of Inside the National Writing Project: Connecting Network Learning and Classroom Teaching. “The ‘Model’ and the ‘Work’: Creating a Social Context for Learning” captures the unique culture of the “highly participatory, teacher-centered” professional community at NWP sites that we were all striving to refine at our local sites. As we talked about the multiple transitions at our site, Tom Pankiewicz, co-director and invitational summer institute director at Prairie Lands Writing Project (MO), told us how regular visioning retreats had supported his site through its transition with a new director and have continued to have a powerful impact over time on leadership development and program growth. “It was at our first visioning retreat, when we engaged our teacher-leaders in co-creating a vision for the site, that everything changed,” he said. As we learned how retreats had transformed the culture of Prairie Lands, Pankiewicz suggested that we begin by reading “Visioning Retreats as a Strategy for Site Development and Leadership Development,” a resource that outlines the goals and guiding principles of such retreats. He also pointed us to the continuity monograph (Re)Visioning Site Work: Extending the Reach and Relevance of NWP Sites, which captures the impact of visioning retreats on leadership development at the Live Oak Writing Project (MS) and the Prairie Lands Writing Project and shares a rich array of the resources they developed. Back home, our site’s planning team aimed for a balance of time for reading, writing, and group conversations. We wanted to design a structured process and create a context that welcomed new ideas and moved the discussion toward clear outcomes and action steps. In the Retreat Invitation (PDF) we asked participants to come together to create a big-picture focus for the site; identify new program opportunities, resources, and site leaders; and draft a strategic plan. 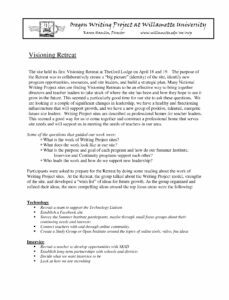 The planning team prepared an annotated list of monographs and other online resources (PDF) and asked participants to read “Visioning Retreats as a Strategy for Leadership Development and Site Development,” chapter 2 of Inside the National Writing Project, a monograph of their selection, and one other resource. Resources and additional reading time were also provided. At the retreat we defined our purpose as we built community. We wrote, talked about, charted, and posted the strengths of the site and the needs of teachers and schools in our service area. In particular, teacher-consultants voiced the desire for the site to establish a stronger technology focus in response to an increased emphasis on technology in area schools. As teacher-consultants began to own the conversation and the work, we opened up the agenda (PDF), trusting the process and allowing time to explore key issues as they arose. Rather than break out in groups according to predetermined topics, we identified priorities through consensus. We returned the next day to turn our ideas into an action plan with assigned tasks, set deadlines, and debrief on the retreat process. Rather than producing a to-do list for site leaders, the retreat led to co-created site goals and an action plan as well as a shared sense of enthusiasm and commitment for supporting the work. We published our new site goals and action plan, along with an invitation to join in the work, in our quarterly newsletter (PDF). We continue to revisit the group reports, tasks, and deadlines at each leadership team and advisory board meeting, and we’ve kept our to-do list visible as we check off accomplishments and continue to discuss challenges. Understandings developed at the retreat continue to guide our thinking about site priorities. We now consider how projects align with the needs of our service area and encourage teacher-consultants to see continuity, inservice, and the invitational summer institute as connected components of the site’s year-round goals. We guide projects strategically with an eye toward creating resources and building site capacity to meet the diverse needs of teachers and students in our service area. The scope of activities included planning for accountability and turning our ideas into actions. Happily, we still have much to do. From the retreat came a shared focus and sustained commitment that grew from engaging with a community of respected and valued colleagues. While our site is still a work in progress, we now have a solid foundation on which to build.